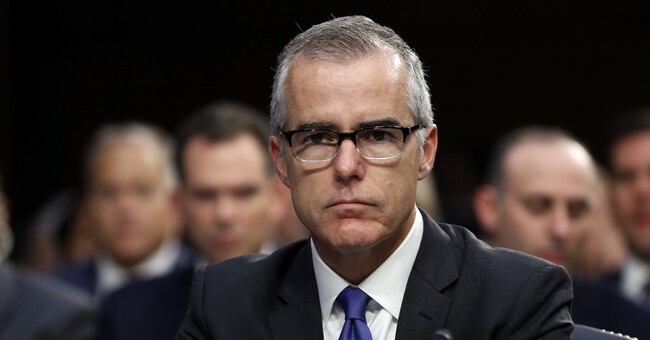 Former FBI Deputy Director Andrew McCabe was fired by Attorney General Jeff Sessions just hours before he was set to retire last weekend. The Justice Department Inspector General Michael Horowitz, who was appointed by President Obama, concluded in his investigation that McCabe had leaked intel to the media and "lacked candor" in the FBI's handling of the Clinton email scandal and other investigations during the 2016 presidential election. Sessions's decision got the full approval of President Trump, who has long sparred with the agency. While Democrats suggest it was a politically partisan move, Guy highlighted the IG report and debunked those claims. The firing of McCabe, he notes, was made at the suggestion of an FBI Ethics Office. Still, in a new op-ed for The Washington Post, the departing FBI official pushes back at the report, arguing it misrepresented his character. You can get a sense of how he feels just from the title, "Not in my worst nightmares did I dream my FBI career would end this way." The worst thing he may be guilty of, he concedes, is not being "clear" enough in his responses, which he blames on confusions and distractions. Many Republicans may agree with the decision to fire McCabe, but not so much the timing. Sen. Marco Rubio (R-FL) believes the way in which McCabe was relieved of his duties was a bit cruel. He "would have done it differently," he told NBC's Chuck Todd.